The reflective strips waterproof raincoat is of light weight clothing, good waterproof properties, comfortable and generous beauty, it can protect your pet from getting wet in rainy day, high visibility during day and night. 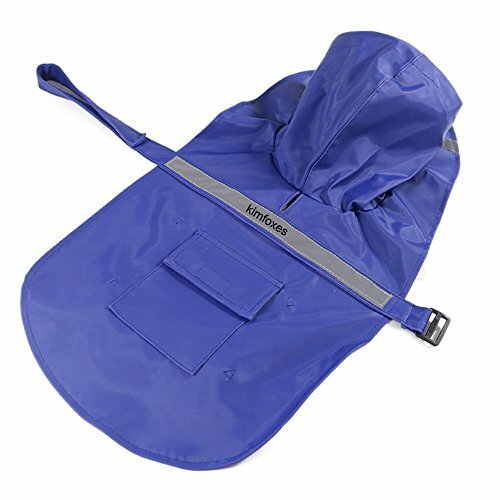 This pet raincoat is simple and practical, it is made of professional outdoor clothing premium PU material, with a high waterproof and high breathable qualities. Convenient velcro design makes it easy to put on and adjust, better save your time and energy. This waterproof raincoat is perfects for many breeds dogs, and the size ranges is from XS to 2XL, especially fits for Large and medium-sized Labs. If you have any questions about this product by Kimfoxes, contact us by completing and submitting the form below. If you are looking for a specif part number, please include it with your message.